On October 23, 1944, both the 20th and 1340th Combat Engineer Battalions were attached to the 28th Infantry Division from Pennsylvania, "The Keystone State." Their shoulder patch was (and is) a red Keystone which led many to call them the "Bloody Bucket Division" because they had taken some beatings and would take more. On November 2, 1944, the 28th Infantry Division launched an attack and captured Schmidt and Kommerscheidt in the Huertgen Forest, suffering heavy casualties. The 20th Combat Engineer Battalion was assigned to keep the road open between Vossenack and Schmidt, while the 1340th acted as infantry to defend Kall River Bridge. However, a promised heavy machine gun unit and a forward artillery observer failed to show up. On November 6th, strong German counterattacks drove the 28th Infantry Division from Schmidt and Vossenack. 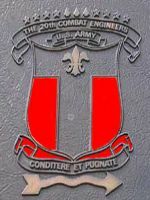 Both the 20th and 1340th Combat Engineer Battalions were committed as infantry, and both repulsed small counterattacks. One evening just before dark, a German officer under a "white flag" advised Captain Frank Bane of Company A that the Germans were going to attack later that night and suggested that the Engineers surrender to avoid more casualties. Bane responded, "Hell No," and sent the German officer on his way. We were attacked and we held. On November 9th, with snow and freezing temperatures, V Corps ordered Infantry units with supporting weapons to relieve the Engineers, and the 20th and 1340th withdrew on the night of November 10th. The cost was very heavy. The 20th Battalion had 144 casualties of which 103 were killed, wounded, or captured. The 1340th Battalion went in with 330 officers and enlisted men and came out with 78 effective personnel. Many were killed, wounded, or captured, but most suffered from "Trench Foot," caused by prolonged exposure to wet and cold that cut off blood circulation to the feet (a form of gangrene). V Corps furnished hospital tents and some canvas cots, and we took care of our own casualties. On November 18, 1944, 28th Infantry Division commander Major General Norman " Dutch" Cota sent a letter commending the 20th and 1340th for "their untiring and unselfish devotion to duty under heavy enemy fire." As the 1340th chronicle records, "Here a separate chapter in the history of this organization was written in blood and agony." 2nd Lt. Joseph Alter (B Company, 1340th) volunteered to assist in the evacuation of wounded in the Hurtgen Forest on November 8, 1944. 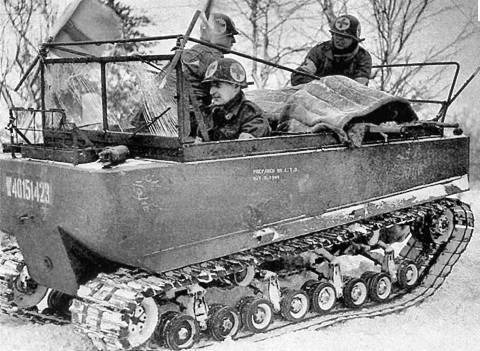 As he was looking for a vehicle, he passed through the village of Vossenack where he found a weasel (a light-weight vehicle on wide tracks) which was perfect to travel over a foot a snow that had fallen. He asked the medical personnel in the church who had possession of the vehicle to accompany him but they refused to cross the open meadows to get to the wounded. 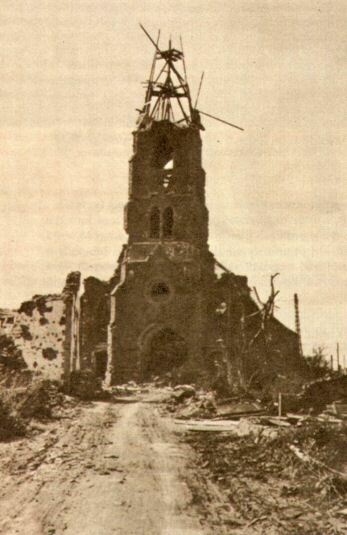 An enemy barrage started and the medics rushed into the basement of the church. Since a weasel steers with two levers like a bulldozer which any engineer can operate, it was to tempting to resist and off he went on the weasel. When the medics heard the weasel start up they rushed out of the cellar cussing but they were too late to stop the weasel. Alter then delivered medical supplies to the engineers that were serving as infantry' and through heavy artillery fire he evacuated four seriously wounded soldiers. The following day Alter used the weasel to guide a group delivering water and rations, and on November 10th Alter used the weasel to deliver orders from V Corps for the 20th and 1340th battalion to withdraw from its position under cover of darkness. Alter was not wounded but during this period, eleven were killed and about sixty were wounded. Eventually Alter returned the weasel to the medics. 1340th commander Truman Setliffe recommended a Bronze Star for Alter's "disregard for his personal safety" and it was officially granted by V Corps headquarters on March 10, 1945. In the citation, the words "stole the weasel" were revised to read "acquired the weasel" and there were no repercussions for the theft. Alter concludes this story by stating, "Honest, I never again stole anything that valuable."